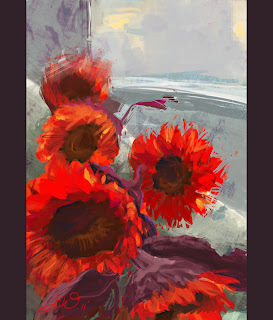 I found some bright red/orange sunflowers on my way home today. I kinda hate flowers most of the time, but these ones were cool with me. And you also get to see a blurry version of the view outside my window. Neat. At last I have my stuff organized enough that I can finally upload it all. So here's some thumbnails from various assignments, theme: greek assignments 1, 2, and 3, and at the very bottom is a preview for the next post with theme: Noah's ark. These ones are the quicker homework assignments, not the final polished pieces; those come later.